Evolution Motorsport is proud to announce the EVR425 Performance Package for the 2015-2016 Porsche Cayman GT4 and Boxster Spyder! Since the debut of the original 986 Boxster in 1996, Porsche enthusiasts have relished the driving experience that combined mid-engine predictability to the sharp front end response of a 911--creating an objectively superior chassis platform to the rear engine Porsche flagship. However, to prevent the 'baby Porsche' from impinging on the top-of-the-line 911, the Boxster and later the Cayman were always saddled with smaller, weaker engines, suspension, and brakes from the factory. While the mid-engine cars were a joy to drive, their lesser capabilities meant they were always somehow slower than their rear-engine big brother. Thankfully, the aftermarket had solutions to these problems. In 2008, Evolution Motorsports debuted the RS350 and RS370 packages for the 987 Boxster and Cayman that used simple bolt-on intake and exhaust upgrades together with EVOMSit software to add more than 50hp to the previously tame 3.4L engine, transforming its performance and elevating the 987 into a giant killer on the track. This same philosophy carried over to the DFI engine in the 987.2, which added the Cayman R and Boxster Spyder to Porsche's line up. With RS370 upgrades installed, Cayman Rs have been seen looming large in the mirrors of early 911 GT3s around the race track for years. In 2015, Porsche finally announced that they were taking the reins off the Cayman and Boxster by installing the full size 3.8L Carrera S engine behind the driver's seat and fitting the cars with suspension, brakes, and features similar to those typically found on the venerable 991 GT3. The Cayman GT4 and very unique Boxster Spyder were presented. While supremely capable and a tactile joy to experience from the driver's seat, common feedback is that even the larger 385hp 3.8L engine felt down on power, with several dead spots in the middle of the powerband that affect the drive out of corners. With our long history of extracting significant power from earlier Caymans and Boxsters in mind and our technical knowledge of the 3.8L as installed in the 911 Carrera S at hand, we sought to extract more performance from the Cayman GT4 and Boxster Spyder and allow them to achieve their full potential. The 981 platform, including the GT4 and Boxster Spyder, comes stock with significantly improved intake and exhaust tracts compared to the 987.2 DFI models. The stock intake system features dual airboxes with large cone filters, essentially doubling the flow capacity compared to the 987. The exhaust tract features significantly improved exhaust manifolds and cats, and the muffler is valved with a nearly straight-through exhaust pathway when the factory sound valves are open. However, when the 3.8L motor was installed in the 981 chassis, it lost the 82mm throttle body from the 991 Carrera S and instead received a smaller 74mm throttle body and matching plenum. IPD's Competition Plenum rectifies this problem, allowing installation of the 82mm throttle body and improving airflow through the plenum to allow for a significant improvement in performance. To allow the engine to take full advantage of the plenum and throttle body, custom application-specific EVOMSit software was developed for the EVR425 package. The result is a smooth and steady increase of 20-30hp across nearly the entire rev band and no fault codes or check engine lights. The software is available in 91, 93, and 100 octane (95, 98, and 102 RON) variants, and incorporates Intelligent Tuning's Integrated Switching Technology to safely and automatically adapt ignition timing to deliver the most safe performance for your fuel and conditions. Options such as left foot braking and a raised rev limit are available upon request. The EVOMSit software is installed exclusively using the included TUNEit Gen 2 OBDII flash tool. This handheld tool is easy to use and installs the software through the OBDII port. 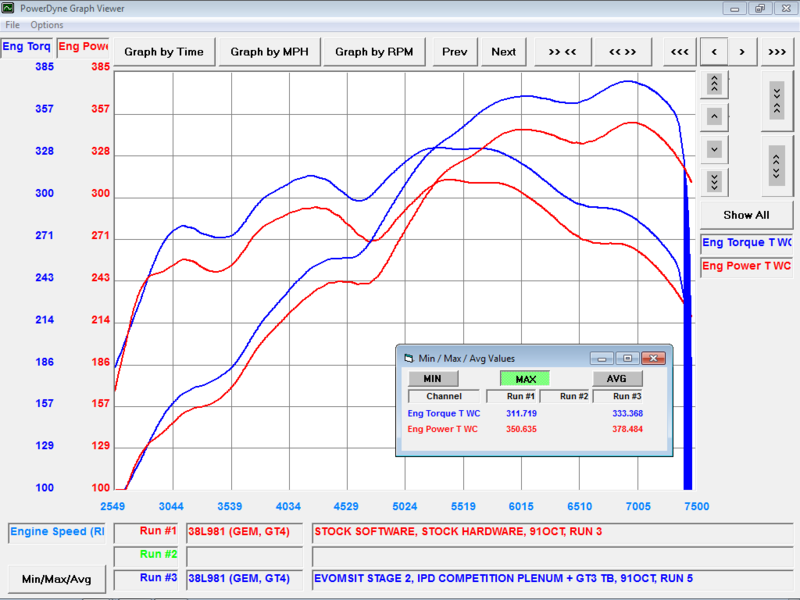 Once configured, the TUNEit tool stores both the tuned and OEM stock software, allowing the end user to switch between tuned and stock files at any time for trips to the dealer or to compete in different classes. This package has been featured on Sharkwerks' GT4 shop car, as seen on DRIVETRIBE, The Smoking Tire, and across the internet.